While I did have a flower in mind while making the sketch, please feel free to use any shape you’d like. That’s part of the fun of challenges — making the sketch work for you. I love flowers, so I couldn’t resist the new Flower Frenzy Bigz die in the new catalog. I used some different sheets of the Typeset dsp to make the flower. All of the flower layers were made using the one Bigz die. I just crumpled them up and straightened them out a little before layering them. I used some of the new Dazzling Diamonds Glimmer Paper for the top layer of the flower. What’s under the flower? The top row is a stamp from Tape It, which I embossed with black embossing powder. The bottom row is some Washi Tape from the Sweet Sadie collection. 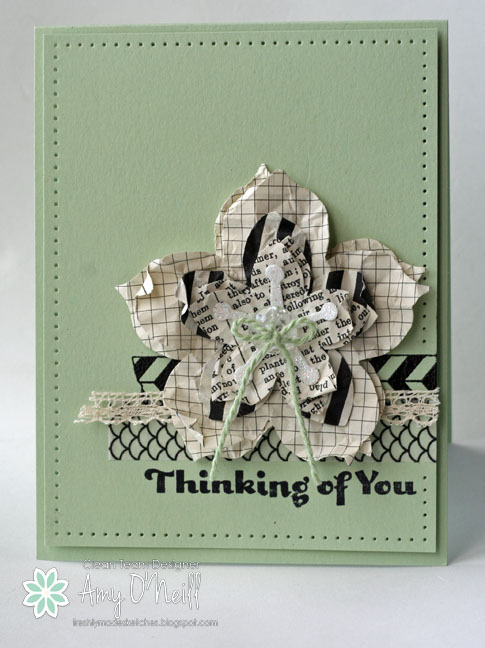 And the sentiment is from the Four You set (I get so much use out of that sentiment set!). The Pistachio Pudding Baker’s Twine was a little thick for the button I used, so I unraveled a couple of the strings on it to make it a little thinner. It was easy to do. The Clean Team came up with some great designs with this sketch, so be sure and check out their creations at the Freshly Made Sketches site for some inspiration. And we hope you’ll be able to play along and post your pictures in the gallery. I can’t wait to see what you come up with! This entry was posted in Flower Frenzy, Four Frames, Freshly Made Sketches Challenge. Bookmark the permalink. Amy, I love how you can keep things so elementally basic, yet your cards are always so pretty and visually appealing. I love this card! Fabulous sketch and fabulous card! Love black with Pistachio! That flower is wonderful! Stil can’t believe we met in SLC! Total fun! Beautiful card Amy! I love the black and vanilla against the pistachio. Very elegant! What a fun flower – I love the wrinkled look! Thanks for a great sketch this week! This was such an awesome sketch, Amy, and your card is amazing, too! I love the colors/monochromatic color scheme and that flower is scrumptious! Amy, your sketch is awesome and I know I will refer back to it for future card layouts. I adore your flower card and the colors are gorgeous…I love all the elements in your cool, graphic card! Love your sketch, Amy, but I love this card even more! The Pistachio Pudding is just a great base for that gorgeous flower. What a gorgeous card Amy! I truly love this colour combo and I absolutely love your sketch – thanks for creating such a great one this week! Love the sketch & your card is fabulous! Very artistic & beautiful! You are brilliant, amazing, fabulous….the list goes on. Seriously love this card. And the sketch. Thanks for a great one!